Calculus, Daily 5, Marching Rangers, and District Reminders! Honors Calculus students have begun studying limits and their connection to Calculus. Mr. Moore explained that students have enjoyed seeing the connections from Algebra to Calculus. He added that his class is very excited for a great school year in our new building! Mrs. Calmes’ kindergarten students have been focusing on the Reading – Daily 5! Mrs. Calmes stated that students are working on building stamina during read to self, work on writing, listen to reading, and word work. “The students are building stamina for Daily 5, so that eventually they can work independently and choose which area they will work on first to practice the skills they are learning in class,” said Mrs. Calmes. The students have enjoyed exploring each of the components of Daily 5. They have especially enjoyed working on the app Epic during read to self and they have enjoyed completing each of the activities during work on words. 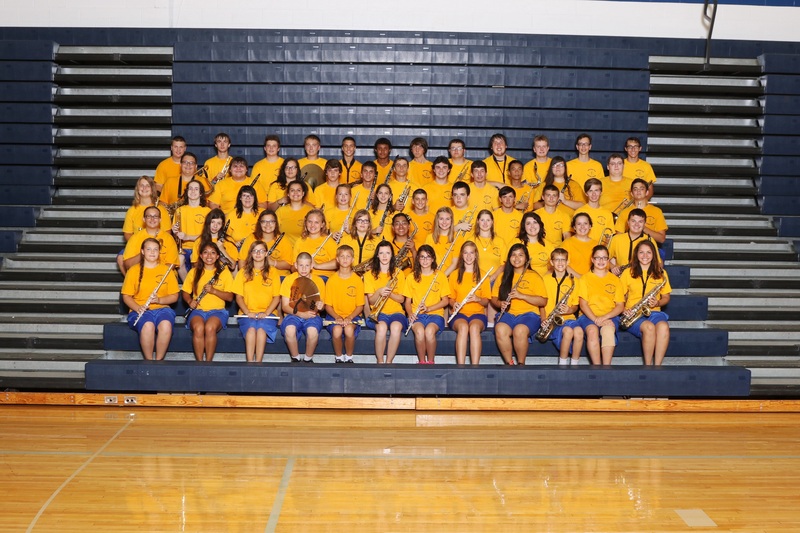 The Marching Rangers recently participated in the Anthony Wayne Showcase of Bands. Eleven marching bands participated in the showcase. The night ended with a mass-band performance of “God Bless the USA.” Below are photos of the event, courtesy of Mr. Kozina. Ranger Rock Garden, Homecoming Festivities, and More! This year we welcome a new school counselor in Mrs. Stephanie Huntley. Mrs. Huntley is originally from Napoleon, Ohio, and received her undergraduate degree from Ohio Northern University. She and her husband Shane then moved back to Northwest, Ohio, when she decided to pursue her Masters in School Counseling from Bowling Green State University. The Huntley’s currently reside in Perrysburg, Ohio with their puppy, Sonny. One interesting tidbit about Mrs. Huntley is that she was involved in throwing shot put for eight years (5th – 12th grade)! Mrs. Huntley feels that the most rewarding aspect of being a school counselor is working with students and helping them achieve their highest potential. The most challenging part is not having all of the answers. She explained that there are many times when she wishes she had a magic wand that would give her all the right answers! Students in Mrs. Elinski’s Honors Algebra 1 and CP Algebra 1 classes have been busy practicing various types of equations. In Honors Algebra, students are working on solving equations for a specific variable. In other courses, the students have learned how to solve basic equations, but these equations are more challenging because they contain more than one variable, making the answers more complex. These are helpful when working with formulas and will become very important when students begin working with linear and quadratic equations. The CP students are currently working on analyzing and interpreting data and graphs. They are learning how to read different types of graphs and how to properly use the information from these graphs. These are important skills for them to have outside of the math classroom for science class as well as real life applications. Taking full advantage of the new modified block schedule, students had plenty of time to learn the new material, and incorporate both group and individual practice! One activity involved students circulating the room to practice the various types of equations. While the students were circulating, they were able to ask each other questions, and ask Mrs. Elinski for help as well. Mrs. Elinski stated, “It is great listening to the students help one another and give detailed explanations in their own words.” Mrs. Elinski continued by explaining that students have enjoyed being able to get out of their seats for a while to practice their equations. They also seem to really like being able to help each other as they rotate. “Every student sees things a little differently, so it is great to be able to give them time to explain topics in their own way; both to their peers and to their teacher,” said Mrs. Elinski. Elementary Art Teacher, Ms. Diamond, has been surrounded by rocks as she started the new year with K-6 Art classes! All students in Pre-School through 6th grade have painted a rock for a special installation to be placed outside in the flower beds alongside the gymnasium by the playground. Each student has their name on the stone, as well as their graduation date. Soon, the 7th – 12th grade student rocks will also be added. Each coming school year, the new Kindergarten class will add to the installation! The project was directed by NES Principal, Mrs. Lindsey Krontz. The project was inspired by the book, You Be You, by Linda Kranz, which encourages creativity and individuality. It is an inspirational message for the children to remember how unique they are, yet how they are part of a very special community of people. Ms. Diamond added that students love to paint! She added, “The excitement was palpable! They shared their ideas for creating the ‘fish’ stones!” Ms. Diamond concluded, “Many thanks to Mrs. Krontz for bringing an enjoyable experience to the children. All supplies were provided by her generously. Thank you also to the custodial staff for moving big bags of rocks!” Be sure to stop by our new Ranger rock garden soon! Congratulations to our 2017 Homecoming Candidates! Spirit Week is next week for our NES and NHS Rangers! Catching Up with our Ranger Bands! This week the Ranger Roundup caught up with Mrs. Petteys to discuss our wonderful Marching Rangers and our up-and-coming musicians in the 5th and 6th grade band! The high school marchers are now focusing on concert band pieces and are working toward their February concert. Fifth and sixth grade students are focusing on their December 14th concert! The high school band just finished the marching season with a performance in the Toledo Holiday parade! Mrs. Petteys stated, “We had a great year supporting our Ranger fans. We also had the chance to perform at the Vermillion Band Festival and participated in Northwood’s first Fall Festival Parade!” Students really enjoyed supporting the Ranger football team and working with the cheerleaders to pump up the Ranger fans! They also enjoyed representing Northwood at events outside of the community! Now that students are moving on to concert band season, students are focusing on a few movie selections, some more traditional pieces, and a march for the February concert. Additionally, some of our Rangers are working on solo and ensemble contest pieces and getting ready to play in pep band for basketball season! Fifth grade band is working out of their beginning band book Essential Elements 2000. All students in fifth grade band are new to playing an instrument this year. Mrs. Petteys added that 55 percent of the fifth grade class is in band this year! Students’ first day of class included putting instruments together and trying to produce a sound out of the instrument. Students have now been playing for a couple of months and can play six different notes and rhythms, giving them the ability to play recognizable songs! Sixth grade students have moved out of their first-year book and are now playing full length pieces of music! Mrs. Petteys has even thrown in some tricky rhythms and students are doing a great job of learning them! Students are playing “Midnight Mission,” “Lizards!,” and “Soar of the Dragons” for the December Concert! New Teachers & Music Boosters! Amanda Johnson, who is entering her 10th year of teaching, is our new elementary Life Skills teacher for the 2016-2017 school year. Last year she taught at the Autism Model School in Toledo, Ohio. Prior to that, she taught in both Kentucky and Florida. When asked what she is most looking forward to this school year, she explained that she is really looking forward to becoming a part of the Northwood family. She stated, “Everyone has been very inviting and welcoming so far!” When asked about her classroom plans, she explained that her students can look forward to some exciting Community-Based Instructional field trips this year! The Northwood High School Music Boosters are ready to kick-off another great year and are looking to add additional members! Choir and Drama teacher, Mrs. Annette Slater, explained that music boosters is an organization that provides a variety of support for the various music groups at Northwood. The music boosters meet once a month at 7p.m. in the high school music room. Both Mrs. Slater and band director, Mrs. Tracey Petteys, send emails and Schoology reminders prior to the meetings. The first meeting of the year will take place on Sept. 6th at 7pm. Mrs. Slater stressed that members can be any adult in the community with or without children in the music program. Members can look forward to assisting as chaperones for events, helping make monetary decisions on large purchases, helping with fundraisers, helping with uniforms and costumes that may need repaired or made, providing support for the directors, and supporting the students at concerts and in various outside music programs. Mrs. Slater explained that the music boosters are an integral part of the music program for many reasons. Music Boosters help provide the extra assistance that the directors need at various events. She added, “They are essential in providing support for outside activities such as honors festivals, providing awards for the students at the end of the year, providing scholarships for students, and acting as volunteers for trips and activities.” Mrs. Petteys added that in previous years, boosters have also helped provide students with opportunities to participate in leadership workshops and music camps. Mrs. Slater and Mrs. Petteys added that the band, choirs, a cappella choir, pep band, jazz band, and musical all receive support from the music boosters. Please consider joining the current music boosters on Tuesday, Sept. 6th at 7pm! The Marching Rangers Prepare for Disney! The Marching Rangers will be taking a trip to Orlando, Florida this year from November 27th to December 2nd. Students will have the opportunity to visit Disney’s Animal Kingdom, Epcot, Magic Kingdom, and Disney’s Hollywood Studios. Students will participate in a Disney Performing Arts workshop that will give students insight to what professional musicians experience while performing at Walt Disney World. Students will also perform during the “Disney Festival of Fantasy” pre-parade at Magic Kingdom! During the visit to Disney’s Hollywood Studios, students will have an opportunity to learn about how movies are made. Additionally, they will get to enjoy the laser light shows “Illuminations” and “Fantasmic” during their stay. This is sure to be a fun-filled and educational trip for our NHS musicians! This year, we are trying something new to the district! The Music Department will be selling fresh fruit (and cheesecakes) for their annual fall fundraiser. The sale is sponsored by the Northwood Music Boosters. Because this is a unique and new company and item for us, we wanted to personally invite you to check it out! Other schools have had great success with this and we hope to join that list of success stories! The sale runs for the entire month of November and the fruit will be delivered to NHS around December 14th. There is also an option to have it delivered to your own home or send as gifts to family and friends far away. There will be order forms sent to each building secretary to display in the office. We are collecting money as we take the orders. We thank you in advance for checking this out and helping support our music programs. Please feel free to share this website with friends and family.